Photo by Ursula Bach: The Cycle Serpent is wide enough so that overtaking is possible even if someone is cycling next to their child. The story behind the City of Copenhagen’s new bicycle bridge, the Cycle Serpent, is the story of an overpass that benefits the city space and road users. Many Copenhageners know it. You cycle towards the shopping centre Fisketorvet and want to take a short cut over Bryggebroen to Islands Brygge to, for example, take a swim in the harbour. Suddenly the cycle lane comes to an end and you have to lug your bike down a load of steps, and cyclists and pedestrians have to share the limited space on the steps that lead from the main entrance of Fisketorvet down to the swimming area of the harbour at Kalvebod Brygge. It is five and a half metres down to the harbour, and until June of this year walking up and down those steps carrying a bicycle was part of the daily hubbub for 11-12,000 Copenhageners. Copenhagen Municipality has now done something about this, and the solution has become something of an attraction. Next to the steps is now a 235 metre long bicycle bridge. It has been given the appropriate name The Cycle Serpent, as it weaves its way around the glass-fronted buildings on the harbour front level with the first floor. 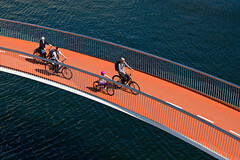 The bridge is exclusively for bicycles, and pedestrians no longer need to fight for space with the cyclists on Havneholmen. The Cycle Serpent’s surface is orange to the delight of onlookers and cyclists. It is an artificial surface dusted with quartz sand dyed orange, which gives traction so cyclists won’t slide, and which gives the Serpent something recognisable. It is four metres wide, which makes it possible to cycle side-by-side and still have room for those overtaking – even on the bends. Photo by Ursula Bach: The Cycle Serpent means that cyclists crossing Bryggebroen don’t have to lug their bicycles up the steps to Fisketorvet’s entrance anymore. Instead, they can enjoy the view of the harbour whilst elevated between the surrounding, glass-fronted office buildings and the dedicated harbour pool at Fisketorvet. 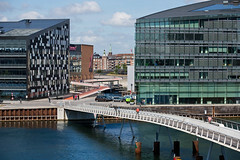 The Cycle Serpent was drawn up by Dissing+Weitling Architects, who also designed Bryggebroen. The connection wasn’t originally thought of as a bridge, just more or less a ramp for bicycles. Dissing+Weitling surprised with their ambitious bridge design and in 2013 they won Copenhagen Municipality’s Push-Up prize for their initiative in designing a solution that exceeded all expectations. The bridge cost 38 million Danish kroner, 6 million of which came in funding from the state. After the design phase, which began in 2010, construction started at the end of 2012. At that time, the bridge was expected to be finished in the second half of 2013, but the project was delayed primarily because of problems with the delivery of the steel for sections of the bridge and the ramp that came by freighter all the way from Shanghai. The Cycle Serpent could finally be opened officially on June 28th, where head of the city’s Technology and Environment Department, Morten Kabell, took followers on a cycle safari, and there was salsa dancing, crossfit and a treasure hunt at Fisketorvet where there is now a whole new city space now the bicycle traffic uses The Cycle Serpent. The establishment of The Cycle Serpent is one part of Copenhagen Municipality’s goal of becoming the world’s best city for cycling. Copenhagen’s network of cycle lanes must be connected so that the bicycle becomes an even easier and faster choice for the people of Copenhagen to get around the city. Missing links in the network should be removed by, for example, establishing new bicycle lanes, bridges, tunnels and throughways to make road junctions safer. It is estimated that the time saved by cyclists because of The Cycle Serpent amounts to more than 5 million Danish kroner, with many other positive effects not even taken into consideration. On top of that, it is expected that the number of cyclists will rise now the Serpent is open. That means that The Cycle Serpent will have paid for itself in 8 years, based on timesaving alone. « Johannesburg: On Your Bikes!